The sun has been our and so do I. Been looking for these plaid/gingham skirt for a while already and finally Tobi make it real! Paired my new Tobi skirt with a cream 3/4 sleeve sweater from Forever 21 and high knee boots to keep me warm in the cold London. Plaid skirts trend was again rising at the end of 2017 and let me share you few tips how to style your perfect plaid skirt! Before we start, let's throwback some descriptions! Plaid is a pattern consisting of crossed horizontal and vertical lines in multiple colours. It is originated in wowen wool but not it can be found in many materials. Pair your plaid skirt with one colour off shoulder top and ankle heeled boots for a chic look. Midi plaid skirt would go well with an oversize trendy sweater and pumps. For rainy days, wear your plaid skirt with a black sweater, over the knee boots and your trench coat. Wear your skirt with a white blouse and a cardigan or chunky knitwear over your shoulder. Wear pair of sneakers or ankle boots with this look. For more formal look, wear your plaid skirt with a pastel colour or white shirt or blouse. Wear your heels or balerinas with it. The joy of plaid or gingham pattern is that you can style it in a grunge or classic way. You can either go for plaid skirt, shirts or even pants. With the skirt, you can find many style of skirts. Whether it will be in length or the cut, such as pencil or A-line skirt. Whiever you will go for, this pattern will be never get bored of! 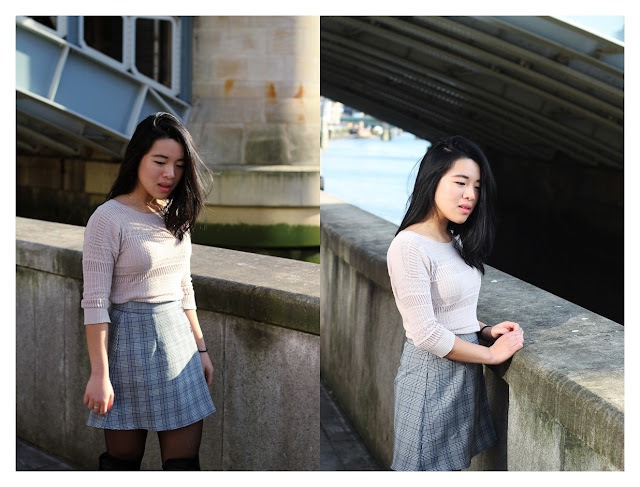 Get the skirt as I am wearing on Tobi e-shop! I have paired the skirt with a light caramel 3/4 sleeve top from Forever 21 and my favourite high knee boots from CCC. I think im gonna need that one.